کمّیت و کیفیت چربی استخراج‌شده از ریزجلبک‌ها شدیداً متأثر از روش انتخابی برای تخریب و شکستن سلول‌ها و نوع حلال می‌باشد. در این پژوهش با مقایسۀ چندین ماده و روش متفاوت، شامل آنزیم (سلولاز و فلورزایم)، التراسوند و هموژنایزر با سطوح مختلف و حلال‌های آب، اتانول و متانول مؤثرترین شیوۀ تخریب سلول‌های ریزجلبکی Dunaliella Salina و بهترین حلال به‌منظور استخراج اسیدهای چرب موردبررسی قرار گرفت. براساس نتایج آنزیمی میزان روغن استخراجی با سطح سلولاز 3 درصد و فلورزایم 1/5 درصد برابر 2/04 گرم بر لیتر برحسب وزن خشک جلبک، التراسوند میزان روغن استخراجی 1/61 گرم بر لیتر در مدت زمان 3 دقیقه و ترکیب روش‌های آنزیمی و هموژنایزر 2/26 گرم بر لیتر ثبت گردید. ازطرفی میزان اسیدهای چرب C18:1، C16:0 و C18:2 استخراجی در بین 3 حلال مختلف اتانول به‌ترتیب به میزان 8/22، 1/08 و 5/18 درصد ثبت گردید. نتایج به‌دست‌آمده از این پژوهش، ترکیب روش‌های آنزیمی و هموژنایزر برای تخریب دیوارۀ سلولی و استخراج اسیدهای چرب با حلال اتانول را به‌‌عنوان راهکاری مناسب و مؤثر پیشنهاد می‌نماید. Azachi, M., Sadka, A., Fisher, M., Goldshlag, P., Gokhman, I., & Zamir, A. 2002. Salt induction of fatty acid elongase and membrane lipid modifications in the extreme halotolerant alga Dunaliella salina. Plant physiology, 129(3):1320-1329. Bai, X., Naghdi, F.G., Ye, L., Lant, P., & Pratt, S. 2014. Enhanced lipid extraction from algae using free nitrous acid pretreatment. Bioresource technology, 159:36-40. Chen, H., Jiang, J-G., & Wu, G-H. 2009. Effects of salinity changes on the growth of Dunaliella salina and its isozyme activities of glycerol-3-phosphate dehydrogenase. Journal of agricultural and food chemistry, 57(14):6178-6182. Chisti, Y., & Moo-Young, M. 1986. Disruption of microbial cells for intracellular products. Enzyme and Microbial Technology, 8(4):194-204. Choi, S-A., Jung, J-Y., Kim, K., Lee, J-S., Kwon, J-H., Kim, S.W., Yang, J-W., & Park, J-Y. 2014. Acid-catalyzed hot-water extraction of docosahexaenoic acid (DHA)-rich lipids from Aurantiochytrium sp. KRS101. Bioresource technology, 161:469-472. Cravotto, G., Boffa, L., Mantegna, S., Perego, P., Avogadro, M., & Cintas, P. 2008. Improved extraction of vegetable oils under high-intensity ultrasound and/or microwaves. Ultrasonics sonochemistry, 15(5):898-902. El-Baky, H.H.A., El-Baz, F.K., & El-Baroty, G.S. 2004. Production of lipids rich in omega 3 fatty acids from the halotolerant alga Dunaliella salina. Biotechnology, 3(1):102-108. Gordillo, F.J., Goutx, M., Figueroa, F.L., & Niell, F.X. 1998. Effects of light intensity, CO2 and nitrogen supply on lipid class composition of Dunaliella viridis. Journal of Applied Phycology, 10(2):135-144. Grima, E.M., Belarbi, E.-H., Fernández, F.A., Medina, A.R., & Chisti, Y. 2003. Recovery of microalgal biomass and metabolites: process options and economics. Biotechnology advances, 20(7-8):491-515. Günerken, E., D'Hondt, E., Eppink, M., Garcia-Gonzalez, L., Elst, K., & Wijffels, R. 2015. Cell disruption for microalgae biorefineries. Biotechnology advances, 33(2):243-260. Hoekman, S.K., Broch, A., Robbins, C., Ceniceros, E., & Natarajan, M. 2012. Review of biodiesel composition, properties, and specifications. Renewable and Sustainable Energy Reviews, 16:143-169. Islam, M.A., Magnusson, M., Brown, R.J., Ayoko, G.A., Nabi, M.N., & Heimann, K. 2013. Microalgal species selection for biodiesel production based on fuel properties derived from fatty acid profiles. Energies, 6(11):5676-5702. Jin, G., Yang, F., Hu, C., Shen, H., & Zhao, Z.K. 2012. Enzyme-assisted extraction of lipids directly from the culture of the oleaginous yeast Rhodosporidium toruloides. Bioresource technology, 111:378-382. Kula, M.R. & Schütte, H. 1987. Purification of proteins and the disruption of microbial cells. Biotechnology Progress, 3(1):31-42. Lee, S.-Y., Kim, S.-H., Hyun, S.-H., Suh, H.W., Hong, S.-J., Cho, B.-K., Lee, C.-G., Lee, H., & Choi, H.-K. 2014. Fatty acids and global metabolites profiling of Dunaliella tertiolecta by shifting culture conditions to nitrate deficiency and high light at different growth phases. Process Biochemistry, 49(6):996-1004. McMillan, J.R., Watson, I.A., Ali, M., & Jaafar, W. 2013. Evaluation and comparison of algal cell disruption methods: microwave, waterbath, blender, ultrasonic and laser treatment. Applied Energy, 103:128-134. Meier, R.L. 1955. Biological cycles in the transformation of solar energy into useful fuels. Solar energy research, 23:179-183. Nascimento, I.A., Marques, S.S.I., Cabanelas, I.T.D., Pereira, S.A., Druzian, J.I., De Souza, C.O., Vich, D.V., De Carvalho, G.C., & Nascimento, M.A. 2013. Screening microalgae strains for biodiesel production: lipid productivity and estimation of fuel quality based on fatty acids profiles as selective criteria. Bioenergy Research, 6(1):1-13. Niu, J-F., Wang, G-C., & Tseng, C-K. 2006. Method for large-scale isolation and purification of R-phycoerythrin from red alga Polysiphonia urceolata Grev. Protein Expression and Purification, 49(1):23-31. Olofsson, M., Lamela, T., Nilsson, E., Bergé, J-P., Del Pino, V., Uronen, P., & Legrand, C. 2014. Combined effects of nitrogen concentration and seasonal changes on the production of lipids in Nannochloropsis oculata. Marine drugs 12(4):1891-1910. Peterson, C., Wagner, G., & Auld, D. 1983. Vegetable oil substitutes for diesel fuel. Transactions of the American Society of Agricultural Engineers, 26:322-0327. Qv, X.Y., Zhou, Q.F., & Jiang, J.G. 2014. Ultrasound-enhanced and microwave-assisted extraction of lipid from Dunaliella tertiolecta and fatty acid profile analysis. Journal of Separation Science, 37(20):2991-2999. Salama, E-S., Kim, H-C., Abou-Shanab, R.A., Ji, M.-K., Oh, Y-K., Kim, S-H., & Jeon, B-H. 2013. Biomass, lipid content, and fatty acid composition of freshwater Chlamydomonas mexicana and Scenedesmus obliquus grown under salt stress. Bioprocess and Biosystems Engineering, 36(6):827-833. Santos, A., Janssen, M., Lamers, P., Evers, W., & Wijffels, R. 2012. Growth of oil accumulating microalga Neochloris oleoabundans under alkaline–saline conditions. Bioresource Technology, 104:593-599. Society, A.O.C., & Firestone, D. 1994. Official methods and recommended practices of the American Oil Chemists' Society. American Oil Chemists' Society press. Song, M., Pei, H., Hu, W., & Ma, G. 2013. Evaluation of the potential of 10 microalgal strains for biodiesel production. Bioresource Technology, 141:245-251. 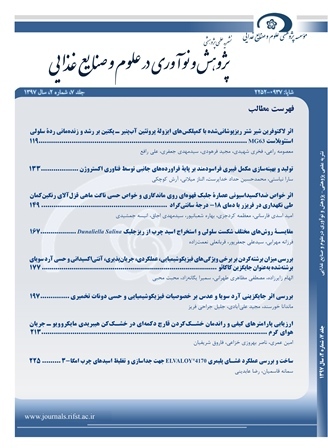 Talebi, A.F., Mohtashami, S.K., Tabatabaei, M., Tohidfar, M., Bagheri, A., Zeinalabedini, M., Mirzaei, H.H., Mirzajanzadeh, M., Shafaroudi, S.M., & Bakhtiari, S. 2013. Fatty acids profiling: a selective criterion for screening microalgae strains for biodiesel production. Algal Research, 2:258-267. Taher, H., Al-Zuhair, S., Al-Marzouqi, A.H., Haik, Y., & Farid, M. 2014. Effective extraction of microalgae lipids from wet biomass for biodiesel production. Biomass and bioenergy, 66:159-167. Thompson, G.A. 1994. Mechanisms of osmoregulation in the green alga Dunaliella salina. Journal of Experimental Zoology, 268(2):127-132. Vo, T., & Tran, D. 2014. Effects of salinity and light on growth of Dunaliella isolates. Journal of Applied & Environmental Microbiology, 2(5):208-211. Wang, D., Li, Y., Hu, X., Su, W. & Zhong, M. 2015. Combined enzymatic and mechanical cell disruption and lipid extraction of green alga Neochloris oleoabundans. International Journal of Molecular Sciences, 16(4):7707-7722. Yap, B.H., Crawford, S.A., Dumsday, G.J., Scales, P.J., & Martin, G.J. 2014. A mechanistic study of algal cell disruption and its effect on lipid recovery by solvent extraction. Algal Research, 5:112-120. Zhang, Y., Deng, C., Cui, Y., & Cheng, J. 2016. Effect of different methods on cell disruption and oil extraction of microalgae. China Oils and Fats, 41(3):61-65.